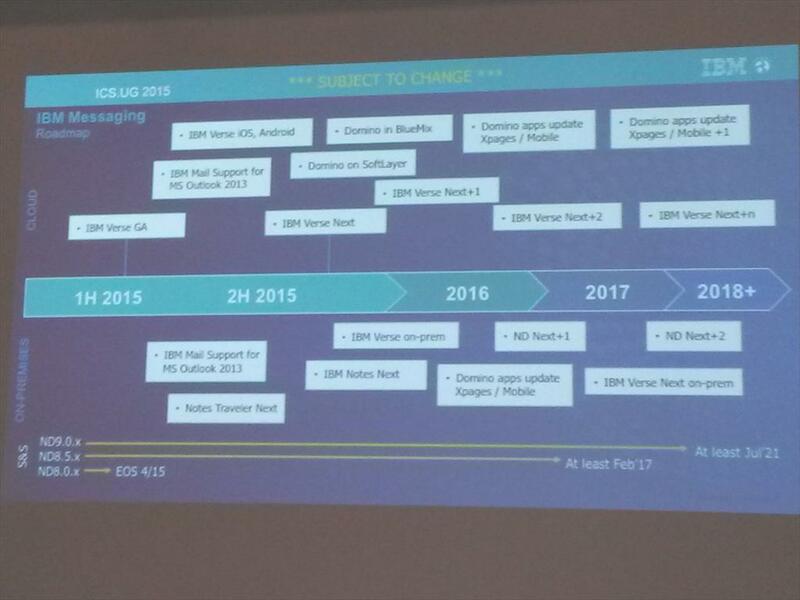 Today at the Keynote of #ICSUG in Germany, Kramer Reeves presented a strategy map for ongoing development of IBM’s Messaging. A big thank you to Henning Schmidt (@schmhen) for tweeting this. Note the ND+1 and ND+2 in 2016/17 and 2017/18 alongside July 2021. This entry was posted in General, Presentations. Bookmark the permalink. If Domino is to be their long term strategic server, any hope of them trying to sell it? Sales drive it all, and they’ve been leaving Domino to fend for itself for years. Well I’m delighted to say i’m not in sales but from their perspective if Domino underpins the architecture for other products and you make people want / need the other products then Domino sells itself. It’s like asking why Apple don’t sell OSX more – they don’t need to since you need OSX to get all the other stuff. Of course I’d like to see more but understand that one message is better than many. I’m happy to see the point “Domino apps update, XPages/Mobile” on the slides. Do I understand it right that IBM is planning to upgrade all their Domino apps to be powered by Xpages in the future? I’d be interested to see common Domino standards apps like the reservation database work as Xpages/Mobile apps. I honestly have no idea as I don’t work for IBM and haven’t heard anything about that I’m afraid. Thanks for sharing. According to your photo we should see a notes next in the end of the year. But unfortunately there are still no details available what will be in this release. This slide was also presented by Kramer Reeves at Engage 2015 this Monday.